​We’re constantly striving on adding new functionality and making improvements to our platform, giving you more and keeping it simple at the same time. Here's some of our latest features for you to take advantage of. 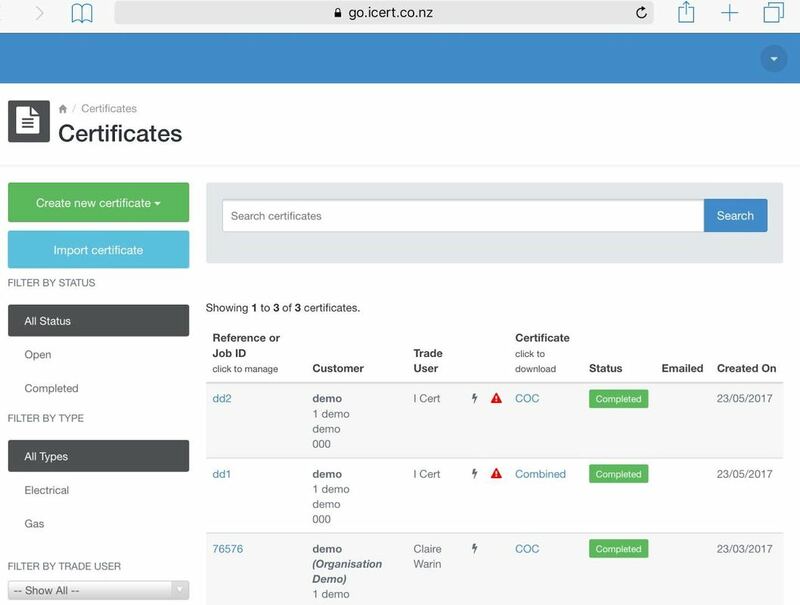 This will allow you to link your iCert account to your simPRO job management system to save you having to rekey your data. 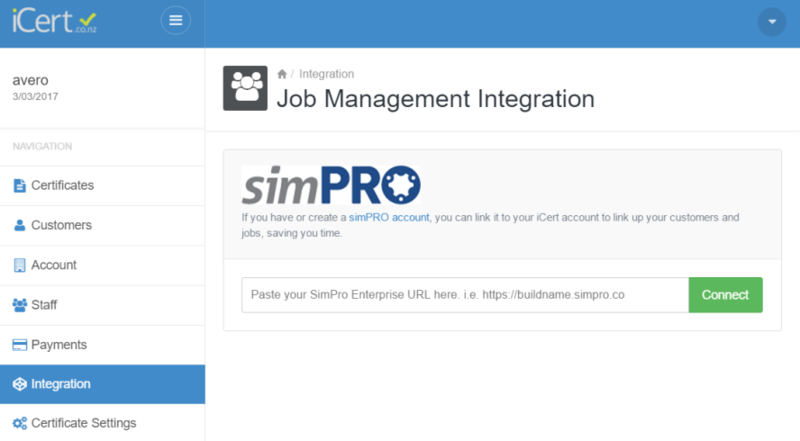 To link to your simPRO account simply navigate to the new Integration menu and enter your simPRO web address and click connect. You will then be asked to login to simPRO and authorise the request. Select the record from the results and you’re away. You can detach the iCert record from your simPRO job at any time by clicking the Detach button. We’ve simplified the client details section to make things easier and quicker on mobile devices. 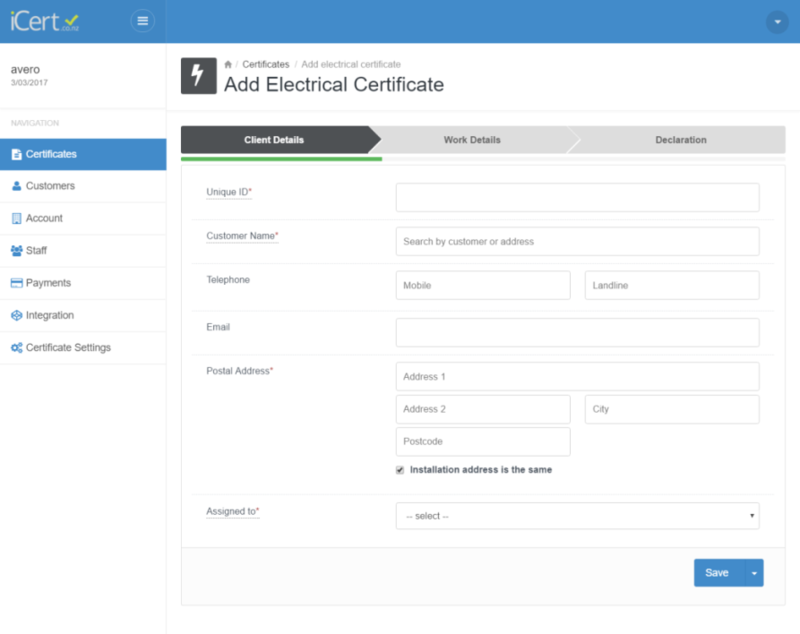 Rather than having separate client and address search fields, you can now search for existing clients using the Customer Name Field, along with Postal and Installation address using the Address 1 fields. By default the installation address will be the same as the postal address. If you want to specify a different installation address, just uncheck “Installation address is the same”. Electricians and Gas fitters are legally required to advise of any areas of concern they notice while carrying out work on site. This "Work required to make to comply with health and safety act" section on the certificate gives you a place to declare any unsafe aspects (health & safety concerns) you notice while carrying out work on site and can also work as a sales tool too. Let's say you were hired to replace a light fitting, and while on site you notice that there's a faulty plug point. "Work required to make to comply with health and safety act" section on the certificate gives you a place to note the faulty plug point and that you advise on fixing/replacing it. This feature covers you should something unforeseen occur later. If you have entered details in the “Work required to make to comply with health and safety act” you will now see a red warning triangle in your certificates summary section. The red triangle indicates that information has been entered into the "Work required to make to comply with health and safety act" section. If you hover your mouse over this red triangle it will display your notes, without you having to go into the Health & Safety section of the certificate. We’ve also changed the formatting of the certificate summary section a little to make it easier to read. We believe in staying on top of compliance & keeping it simple. Thanks to these new features, you can too! We reckon we've earned your confidence and you’ll want to tell fellow tradies but that’s entirely your call.